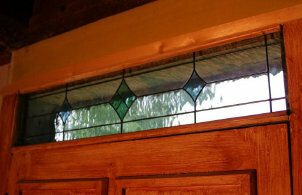 Bobby contacted me about building a small transom for his 1815 farmhouse in Vermont. His initial idea was for an antique rose design which I then designed. However, the more we discussed it, the more we agreed that this transom needed to reflect the simple, practical feel of a house that has survived almost 200 years. Bobby came up with the design above that is in character with the stained glass designs of that era. 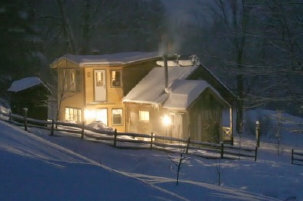 On the left is a photo of Bobby's 1815 Farmhouse in Vermont. When he sent me the photo, I thought he was sending me a Currier & Ives print or a photo from a visit Vermont tourist brochure. He assures me this house really exists! 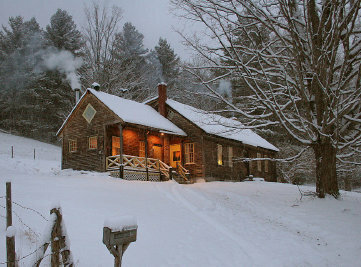 Makes you want to throw a few logs on the fire and curl up with a good book in front of the fireplace. 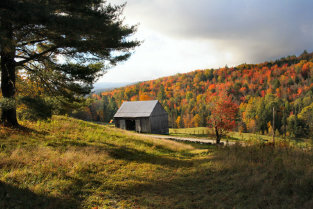 View from house toward barn.....what beautiful country! Note the new addition to Bobby's 1815 home...... to store enough wood for those cold winters. 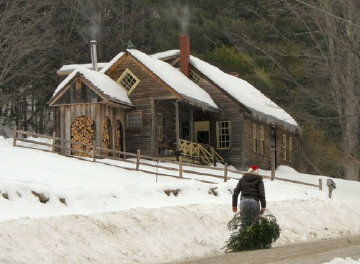 Bringing in the Christmas Tree. Settled in for a long winter's night.